I hope you guys don’t mind another post with a few photos from our Mexican getaway! I just enjoyed the trip so much and want to share all my style hacks and details for an easy, breezy beach look. If you haven’t seen my other posts about Mexico, I just shared a travel diary and this post on my favorite cover-up pants. But today’s post is all about travel accessories! Some things I like to reserve specifically for traveling (especially tropical beach destinations), other things I pull from everyday life! I’m breaking it all down below! Hats are one of my favorite things about being in the sun and going to the beach. For tropical trips, I like to always reach for straw hats. I wore both a straw visor and a regular hat with a wide brim for this trip. They just feel extra beachy to me. I also like to mix it up every once and a while and bring a colorful headband like this one. I like jewelry that’s super versatile and can be worn with any look. This is why I’m obsessed with Victoria Emerson. I talk about Victoria Emerson all the time on the blog and Instagram because I’m always wearing their jewelry. On the Mexico trip, I had this necklace on basically the entire time. It’s dainty, gold and has Swarovski crystals for only $29! It can’t be beat. I’m also in love with this bracelet, which you’ve also probably seen me wear a lot. You can’t go wrong with Victoria Emerson whether you’re on vaca or staying home! I loved being able to break out some of my favorite summer shoes for this trip. I like to wear mostly slides (like this pair I wore non-stop) when I’m vacationing near the beach or if I know I’m going to be hanging out poolside quite a bit. My biggest tip here is to wear whatever pair takes up the most space to the airport. This way you have more room in your suitcase. You can’t go to the beach without your swim essentials. I carried this straw tote with me pretty much everywhere on our trip. It’s big enough to carry everything and goes perfectly with a tropical backdrop. You also have to have a good pair of sunnies at all times. I wear this pair year round because they’re stylish but also simple and neutral. Now all you need to do is book your trip to the beach! 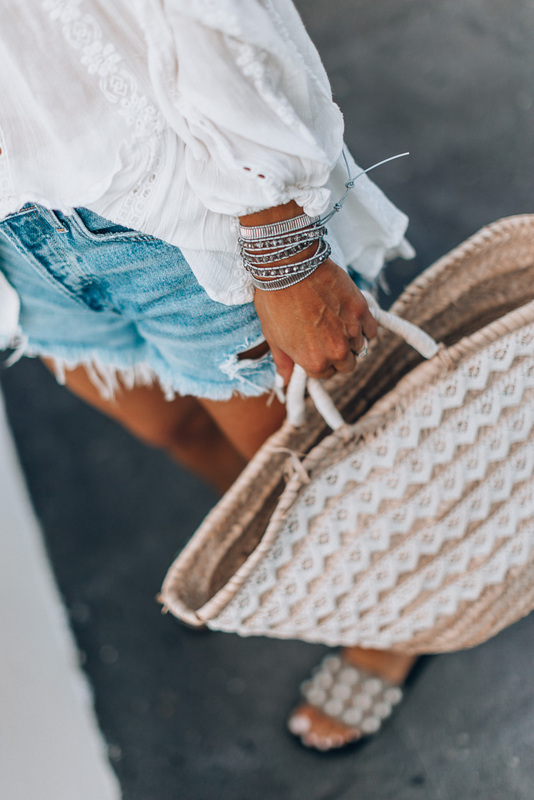 Is there any other essential accessory you have to have when heading on a tropical vacation? Tell me in the comments! ​A big thanks to Victoria Emerson for sponsoring this post!